Look, I get it. The new popularity of the conservative movement is that we have to reduce the size of the government. We have to Spend Less, Tax Tess. Reduce spending and reduce taxes. But we can NOT reduce taxes right now UNLESS we reduce spending. Now, I AM a proponent of the idea that when taxes are raised it acts as an economic inhibitor. That businesses will grow slower or even shrink. That as taxes rise, the amount of money we bring in is actually less than the amount we could have brought in. So, where would you cut? Here is a website that helps you understand where your money is going. It’s easy, just input your salary and you can see how much of your paycheck is going to which programs. THAT is a lot of money! Just shy of 25% of the salary goes to taxes. And that says nothing of the amount of money that goes to taxes when I buy things. Sales tax, both mine and the embedded sales tax. Horrific. However, we have the tax cut thing in spades. We all know that has to come down. But, from the list above, where would you cut? I would reduce the size of the Defense budget. It’s the number 2 line item. And number 2 line items HAVE to be reduced. Simply have to. We need to identify what “Miscellaneous Mandatory Programs” are. And then cut ’em. I’m thinking 25%. Just ’cause. We have to stop growing Medicare and Medicaid. Have to. And a good start is to shrink it. Pino’s recipe for Spend Less. Unpleasant? Sure. Spending less always is. But to be fair, our Liberal Leftist friends have a point. Where would we cut? This entry was posted in Politics: National and tagged Budget, Conservative, Defense, Democrat, Liberal, Medicaid, Medicare, Republican, Social Security, Taxes. Bookmark the permalink. How can we cut government spending when so many people in this country can not even manage their own finances. I make less than $30,000 a year; my wife does volunteer work, yet we live well. We own our house, free & clear. We have a healthy diet with lots of fresh fruits and vegetables. We always have money in the bank for important purchases. How do we get by? We do not have cable TV. We cook most foods from scratch. We never hire contractors to do what we can do ourselves. We ALWAYS pay our credit cards off each month. 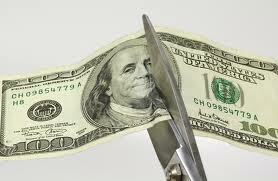 Cutting government spending will only be possible when individuals revise that lots CAN be done with just a little. Our government is wasteful and inefficient because it is run by our citizens which are too often wasteful and inefficient. Our government is wasteful and inefficient because it is run by our citizens which are too often wasteful and inefficient. Henry, I couldn’t have said it better myself. Please consider running for office where ever you live!